Windows fill the double-height manufacturing space with natural light. A 1,435-square-foot apartment tops the three-story structure. In lieu of a dining room, the kitchen features a built-in bar with a pair of Konstantin Grcic’s Stool_One chairs for Magis. The floors are polished concrete, a money-saving move that allowed for splurges like the floor-to-ceiling windows from Chicago Tempered Glass set in Tubelite frames. The living area blends modern classics with contemporary pieces like the black Thing 4 stoneware sculpture by Matthias Merkel Hess and Jonathan Muecke’s brass Low Table (LT), both from Volume Gallery. 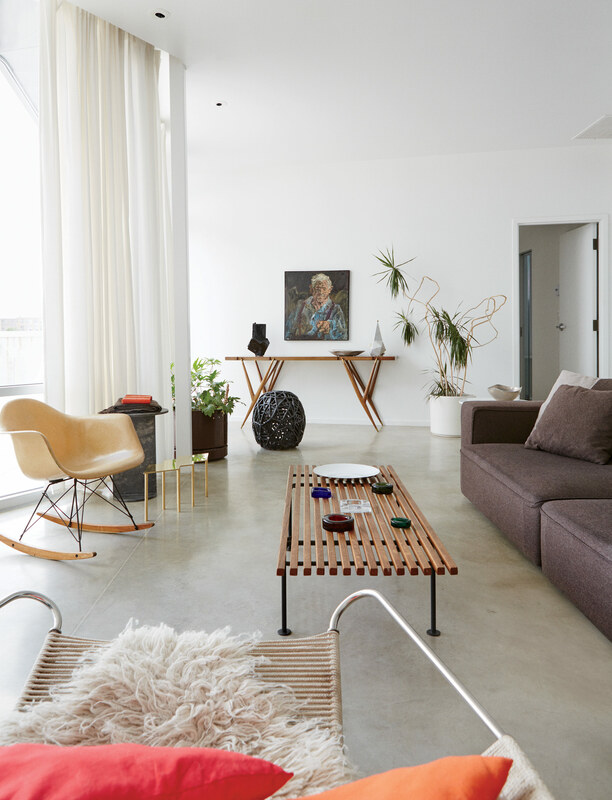 The coffee table is by Harry Weese for Baldwin Kingrey, an early design shop in Chicago, and the RAR rocker by Charles and Ray Eames for Herman Miller belonged to Nicole Sopko’s grandmother. 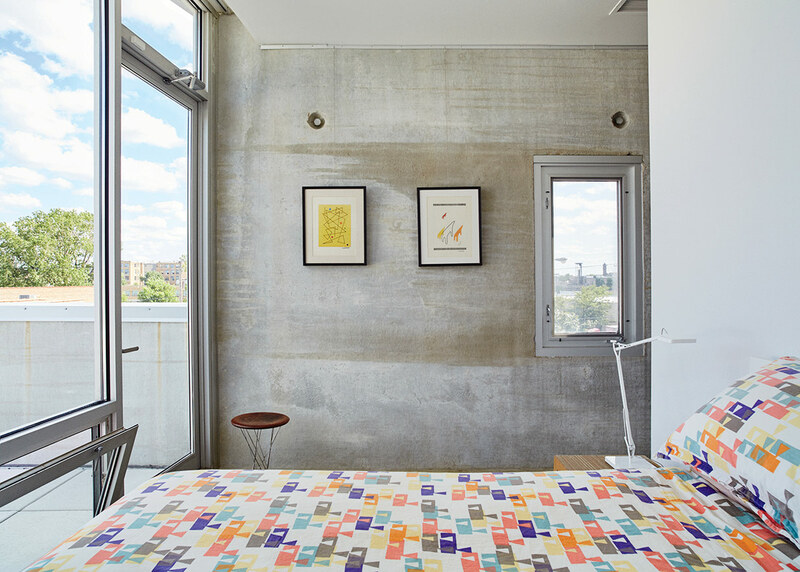 The raw concrete panels serve as a backdrop for the couple’s design collection. The bedroom features a Rocking Stool by Isamu Noguchi for Knoll and a Kelvin lamp by Antonio Citterio for Flos. A steam shower was one of Daniel Staackmann’s main requests; this one is by Mr. Steam with faucets from the Axor Bouroullec line. The office is a showcase that includes an Eames Storage Unit for Herman Miller, a wall-mounted Eames leg splint, and chairs by Eero Saarinen and Harry Bertoia for Knoll. Careful districting has made West Grand Avenue one of the last places in Chicago’s West Town where factories and family homes still exist side by side. Zoned as a planned manufacturing district (PMD) to bolster local commerce, the south side of the street is populated by brick warehouses, while the northern half is mostly residential. Despite the proximity of live and work spaces, incorporating both elements into a single building is practically unheard of in the area, as Daniel Staackmann and Nicole Sopko discovered when they began researching the arterial as a home for themselves and their vegan food company, Upton’s Naturals. The business, founded by Daniel in 2006, requires space for office and storefront operations, as well as manufacturing for their signature product, seitan, a protein-filled meat alternative made by rinsing the starch from wheat. Daniel knew he wanted to be close at all times, a decision that greatly narrowed their search. “We could find plenty of industrial buildings that we could put a factory in, but they weren’t appropriate for retail and definitely not for living,” he recalls. A vacant lot across from the PMD met all their criteria but necessitated a fresh build. Looking to offset the cost of construction, Daniel and Nicole, Upton’s vice president, turned to architect Martin Felsen and designer Sarah Dunn of UrbanLab. 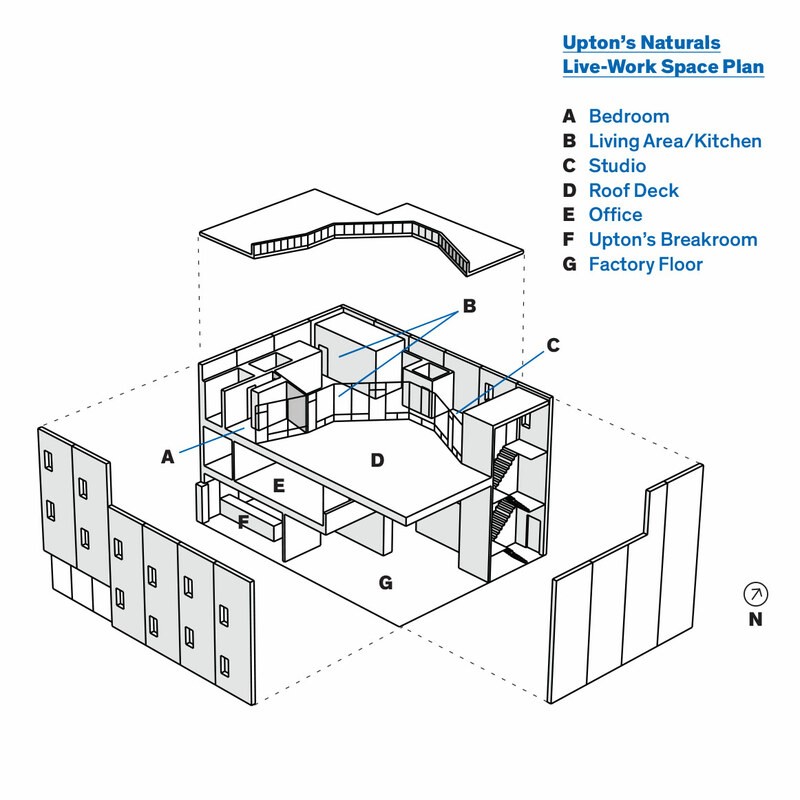 The designers had used prefab elements to make their own live-work space, and set out to create a mixed-use building that wouldn’t shortchange any of Upton’s functions. To that end, Dunn and Felsen proposed a solution that takes full advantage of the corner lot’s siting. Over two days in late 2013, 20 concrete panels were trucked in and hoisted into place. 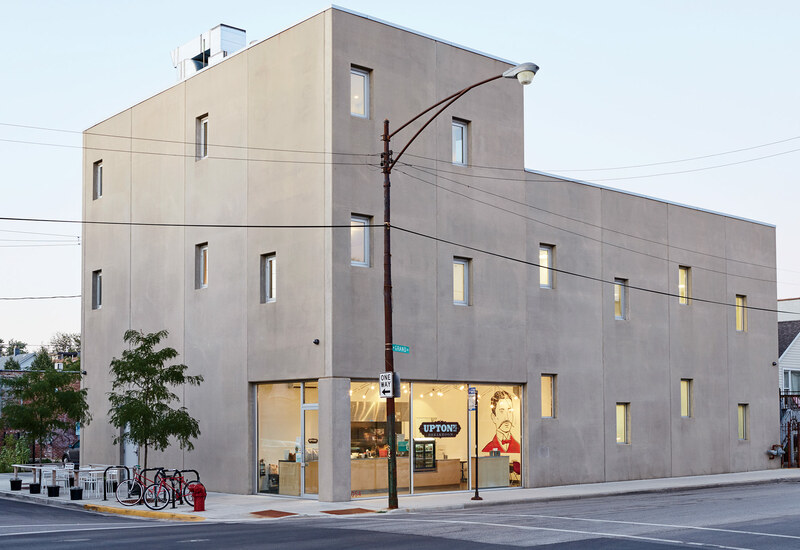 With the building’s three-story raw concrete shell erected, the team spent the next six months installing everything from industrial freezers to the residents’ modern art collection. What emerged is a holistic live-work residence that lets Daniel and Nicole handle all their business in-house. With an interior measuring 8,340 square feet, the space seems imposing, but the designers insist there isn’t an inch of fat, a claim supported by its final price tag: $200 per square foot. Manufacturing and retail occupy the first floor; offices are located on the second. The residents took care to make the business as amenable to its neighbors and 20-person staff as possible. “I’ve done every job here,” says Daniel, “so I know what it’s like to work eight hours in an industrial kitchen.” The factory floor is bathed in sunlight, while the vegan cafe, Upton’s Breakroom, beckons passersby through glass walls. Like the work environments, the 1,435-square-foot top-floor apartment prioritizes natural light and functionality. The bedroom, kitchen, and living area form a U shape around a capacious roof deck with breathtaking views of downtown Chicago. Even in their sanctuary, the couple’s work ethic occasionally finds a home. A room off the kitchen has hosted yoga classes led by Nicole, just one of the ways the building opens itself to residents of the area. On a typical weekday lunch hour, Upton’s Breakroom is busy with regulars from the nearby warehouses. “We live in this neighborhood, we have a neighborhood business, and the neighbors come,” says Nicole.